80 palette<< click here to check out the site.. lots of palettes and other goodies! 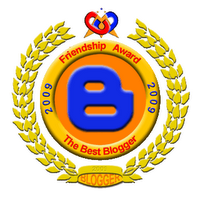 oo and Face Graffiti gave me an award! OMG I love, love, love this look! I might have to try this combo. Very pretty. Ooh this is pretty!! 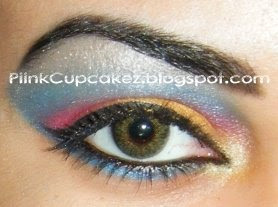 I wish I knew how to blend like that, I dont think I have enough eyelid space for it though lol. This palette looks really nice, would you say it was better than the CS 88? Sooo cool! very vibrnt an looks WOW! Love it! It's sooooo tropical and I love it!! I gave in and bought one lol. I had to answer so many questions it was making me nervous LOL. lovely!!! i cant do anythin like that!! haha ur song makes me wanna dance..
just found your blog and I am loving it!!! Come stop by mine and say hello and check it out. hope to see you around! That's beautiful!!! Nicely blended..and the colors are awesome together! wow thats a beautiful color combo. great job girl! 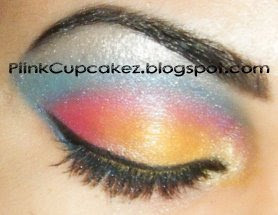 pretty blending, nice color combo! so very pretty! your blending ability is kickass!